The 657 & 807 Squirrel Is an "All New Generation Squirrel" with two booms & Remote proportional hydraulic controls. Machinery manufacturing first commenced from the family’s mixed orchard, dairy & beef farming property “CRENDON” of MC Fry & Sons in Donnybrook, around 1960 by Mick Fry who was responsible for the maintenance and manufacturing of farming equipment. In the early years some of the new machinery was sold to local farmers. This grew progressively until in 1978 the manufacturing identity became CRENDON MACHINERY with his son Neville joining the partnership. The office and workshop of the Company are now based in Donnybrook, Western Australia with Neville Fry as manager. CRENDON MACHINERY has established a strong position in Horticultural and Viticultural machinery manufacturing. CRENDON MACHINERY products are wholly designed and manufactured in Western Australia and are continually developing new and existing products. 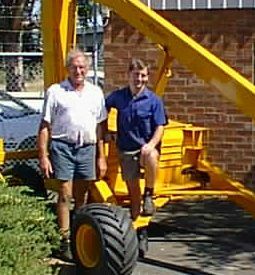 With Mick & Neville’s farming background, unique & practical equipment has been produced for the customer.